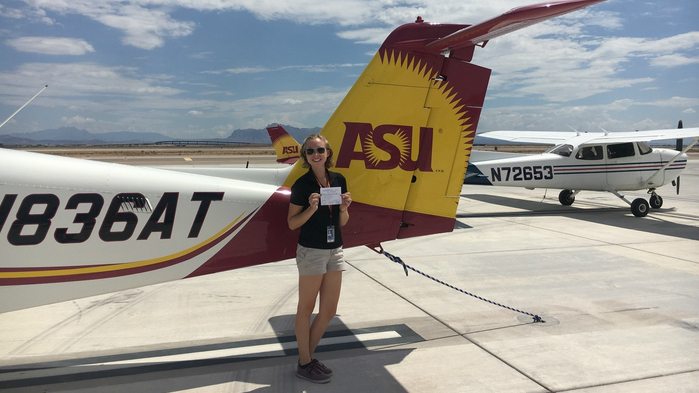 Last month at the International Women in Aviation Conference, the Envoy Flight Department awarded its very first Future Airline Pilot Scholarship to Megan Whittard of Arizona State University. 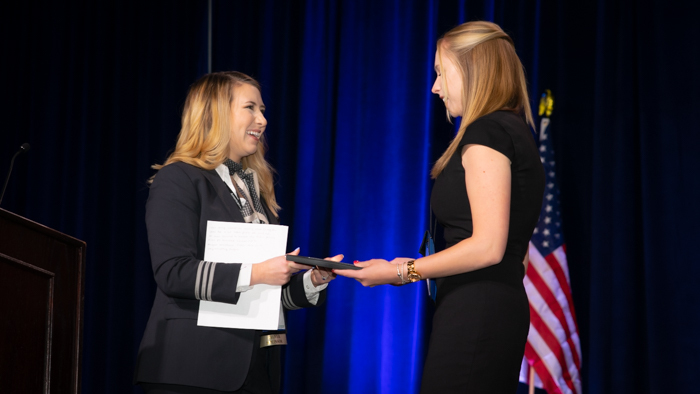 The scholarship awards student pilots based on their qualifications, dedication to the aviation community and a 500-word essay explaining their career goals in the airline industry. The award was presented in front of thousands of women aviators during a special scholarship ceremony sponsored by American Airlines Group. 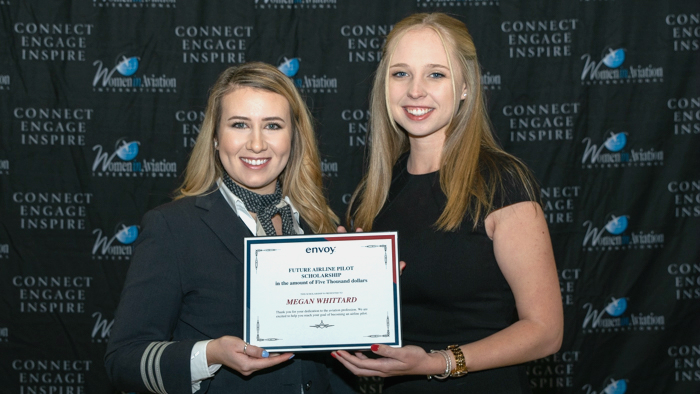 Envoy First Officer Lindsey Richardson presented the scholarship, and in her speech commended Megan for her “discipline and commitment” to her aviation education. 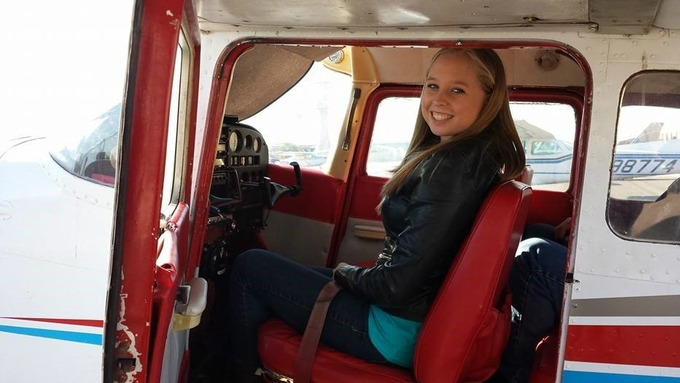 We got the chance to ask Megan about her aviation pathway, her very first flight and her goals for the future. Tell us a little bit about your background and college education. I am 21 years old, born and raised in Arizona. I started my flight training as a senior in high school through the East Valley Institute of Technology, gaining not only my private pilot certification through an internship with University of North Dakota, but also college credit that qualified me as a sophomore my first year in college. I began college in 2016 at Arizona State University in the Aeronautical Management Technology (Professional Flight) undergraduate degree program. I am graduating this semester after three years, with my commercial single/multi-engine license and Certified Flight Instructor (CFI) from that program and from the Barrett Honors College. In addition, I am in my second semester of my graduate degree program in Aviation Management and Human Factors, from which I will graduate next spring. Unlike many aviators I meet, I did not have a family member or close friend that was a pilot growing up. I always had an interest in fast cars, engines, and mechanical engineering, but didn’t decide to pursue aviation until high school. While contemplating possible career paths, I stumbled onto the idea of becoming a pilot. All it took was one discovery flight and cup of coffee with a female airline pilot my father had met, and I never looked back. When did you do your discovery flight? After I decided I wanted to pursue aviation as a possible career path, my parents bought me a discovery flight as my Christmas present. I flew in a Cessna from Falcon Field in Mesa, Ariz. over to see the scenic Canyon Lake and back. It was my first time ever in a small plane, and from there I was hooked. I was thrilled with the experience and haven’t stopped dreaming of becoming an airline pilot since that moment. What’s your favorite part about flying planes? My favorite part about flying is watching the ground fall away beneath you and being able to get away from it all. Every takeoff still excites me, and no matter how many flights I’ve already done that week, each one is different. Arizona is an amazing place to flight train not only for the clear skies, but for the breathtaking sunrises, sunsets, and beautiful landscapes I get to appreciate every day. I work every day to always be a better person. Education opens doors, provides opportunities, and opens your eyes to so many new possibilities in the world. I would not be the person I am today without the many educators that worked hard to inspire me to learn and grow as a person. How did you feel when you learned that you earned our $5,000 scholarship? I was absolutely blown away to find out that Envoy was awarding me this scholarship. I know that there are so many women out there trying to pursue their dream by applying for this scholarship, and I never expected to be the one chosen. I love Envoy and still can’t believe the company I want to work for recognized me with this award at the International Women in Aviation Conference. Why do you think you were awarded the scholarship? I am so excited that Envoy created this scholarship to provide opportunities to women like me, and extremely grateful to Envoy for choosing me. From the moment I set my heart on aviation, I have been welcomed into the community with open arms. And while I have sacrificed my spring breaks, my weekends, my sleep schedule, and so much of my free time in pursuit of my degree and my flight training, this community makes it all worth it. I jump at the opportunity to make a difference and be involved, because there are so many unique experiences that present themselves to those who go that extra mile. I’d like to think that Envoy recognized that and recognized my determination to pursue my dream of becoming an airline pilot; a career path where the biggest obstacle is the cost of flight training. I’m currently instructing for the University of North Dakota at their campus in Arizona, and am training with them to earn my CFI-Instrument as well. Through instructing, I hope to meet my Airline Transport Pilot (ATP) minimums by the time I graduate next spring so I can get hired at Envoy. Any advice for young girls who are interested in aviation and might want to become a pilot? My advice is to just go for it. Don’t ever set limitations on yourself, because with hard work and determination, you can achieve anything. There are so many people out there, especially in aviation, that will recognize your ambition and help you achieve your goals. Success is only a matter of seizing those opportunities, making the most of help that is offered, and passing that support along to the next girl out there who dreams of flying.